An aa .eu, shared wi other European Union member states. The Republic o Lithuanie (Lithuane: Lietuvos Respublika), for ordinar kent as Lithuanie juist, or Liefland, is a kintra in nor-aestren Europe. Ane o the three Baltic States alang the Baltic Sea, it mairches ontae Latvie tae the north, Belaroushie tae the sooth-aest, Poland tae the sooth, an the Kaliningrad Oblast o Roushie tae the sooth-wast. The lairgest an maist populous o the Baltic states, Lithuanie haes aboot 100 km o saundy coastline, that aboot 38 km o faces the open Baltic Sea. Lithuanie's major wairm-watter port o Klaipėda lees at the nairae mooth o Kuršių marios (Curonian bucht), a shauld bucht raxin sooth tae Kaliningrad. The chief river, the Nemunas, an a puckle o its tributaries cairies internaitional shippin vessels. Dalia Grybauskaitė, European Commissioner 2004-2009. Vytautas Landsbergis, Sing Revoliution SAJUDIS, Vilnius, 1989-1993; European Pairlament, 2004-2009. Arvydas Sabonis, Basketbaa, Kaunas Zalgiris. Sarunas Jasikevicius, New Orleans, USA. ↑ "Population at the beginning of the year by ethnicity". DB1.stat.gov.lt. Statistics Lithuania. Retrieved 2 July 2012. ↑ Nutarimas, Constitutional Coort o Lithuanie, 1998. ↑ Number of population, Statistics Lithuania. ↑ Lithuanian 2011 Population Census in Brief (PDF). Statistics Lithuania. 2012. ISBN 978-9955-797-17-3. 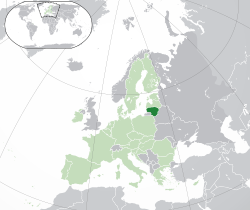 ↑ 5.0 5.1 5.2 5.3 "Lithuania". International Monetary Fund. 2014. Retrieved 18 February 2014. Wikimedia Commons haes media relatit tae Lithuania.